I turned 50 this week. 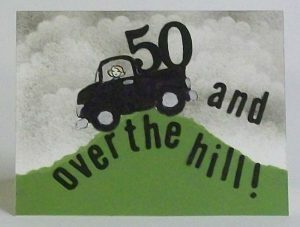 Along with that milestone came what I imagine are the typical feelings that people feel when marking a half-century. I felt nostalgic for the time that has passed and wondered how I could have possibly gotten this far without accomplishing so many of my goals. I felt somewhat daunted by the ever decreasing amount of time I have left. I made lists of goals and counted my blessings. It wasn’t about cake and ice cream. It’s serious business this golden jubilee. I was also reminded just what great lengths we go to in order to hide our feelings. It’s like when someone asks us how we are. It’s customary to respond with “Fine thank you, how are you?” or something similar. We are trained to follow social norms and realize that, in polite company, and even in most cases with our friends and family, people don’t really want honest answers. So, when people offered birthday wishes, I’d smile and say thank you but never delve into a philosophical conversation about the passage of time. And then last night I had the opportunity to accompany my son (Josh) as he checked something off of his own bucket list. He’s been an ultimate fan of everything World Wrestling Entertainment (WWE) since he was old enough to reach the television. (From anecdotal research, there seems to be a link between the 21st chromosome and flamboyant personalities in the squared circle.) 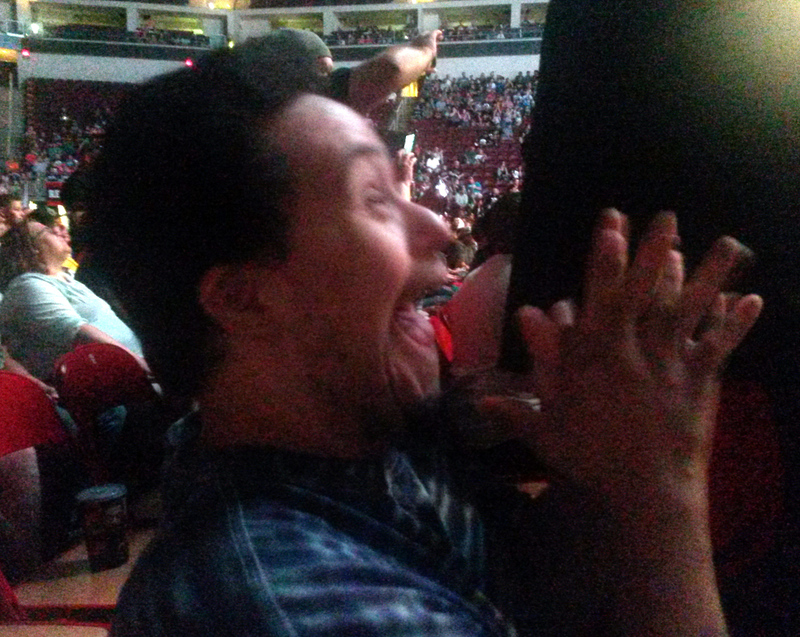 My generous sister-in-law decided it was time for Josh to experience the WWE live and in person. She gave Josh tickets for two floor seats at WWE Live at Hershey Park. One of the things that is difficult for Josh is understanding time. He’ll say “You remember,” [that thing happened] yesterday,” when it actually happened last week, last month, or last year. 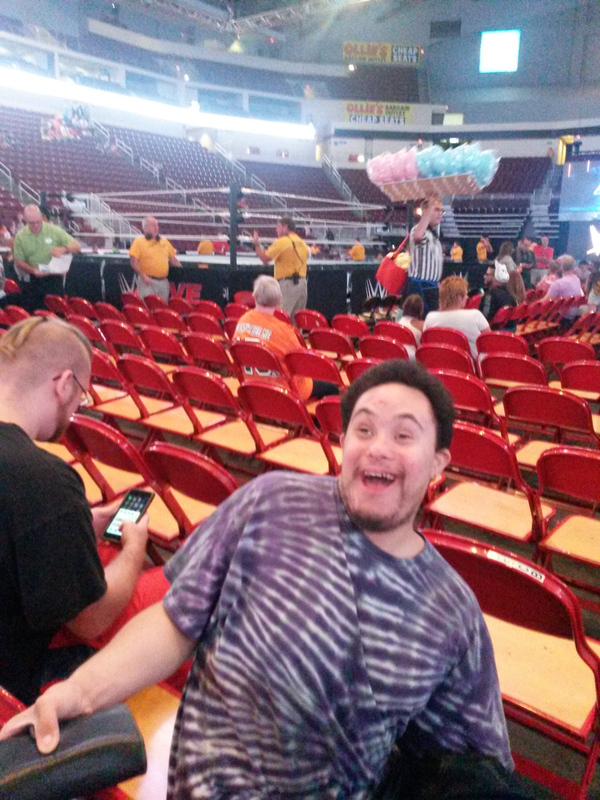 So when exciting things like floor seats at WWE Smackdown are in his future, we tend to wait until the last minute possible to tell him because it’s hard to explain exactly when it will happen and how long he has to wait. But while we shared a certain angst about time these past few days, he certainly has the advantage when it comes to the ability to express his feelings without the bother of conforming to socially constructed norms. As the theme music started to play introducing the entrance of one of his favorite personalities, he didn’t even attempt to hide his enthusiasm. 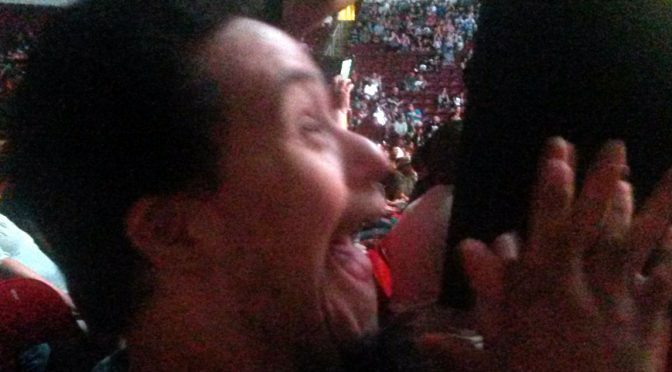 The pure joy and excitement that he feels is contagious. You can’t help but smile and celebrate with him. I envy that. How liberating it must be not to be controlled by society’s rules that say how we’re supposed to feel and who we can share those feelings with. This man, who by the way in a few short months will be celebrating his own milestone birthday marking three decades, was not concerned with what people might say or think about him in that moment. The kind of fun we had at our fifth birthday. Before we learned that we had to stifle our emotions, especially in public. I am grateful that I have Josh to remind me that just because we’re getting older that doesn’t mean we have to stop enjoying everything that life has to offer, including each other.